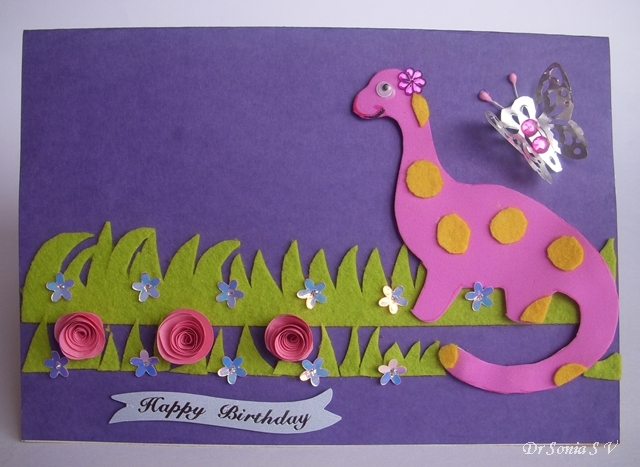 My 5 year old daughter loves dinosaurs and we made this simple dinosaur card from foam and felt.Here is the inside of the dinosaur card with a Pop up Trex. 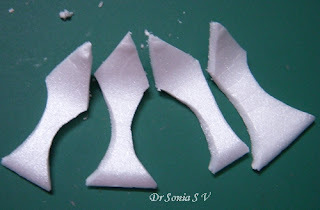 I cut the foam Brachiosaurus outline free hand from foam. Dinosaurs are easy to draw as there is no limit to your imagination!We cut out some yellow felt shapes to use as the dinosaur spots. 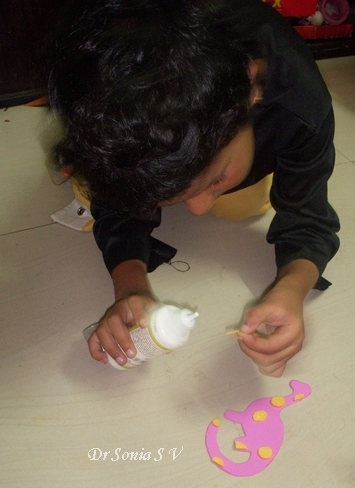 Here is my daughter sticking the yellow felt spots using fabric glue.It takes so much longer to stick felt if you use normal white glue.Little one had fun planning the positioning of the spots! The grass is again free hand cut from a strip of green felt. Here you can see my little helper sticking the felt grass. 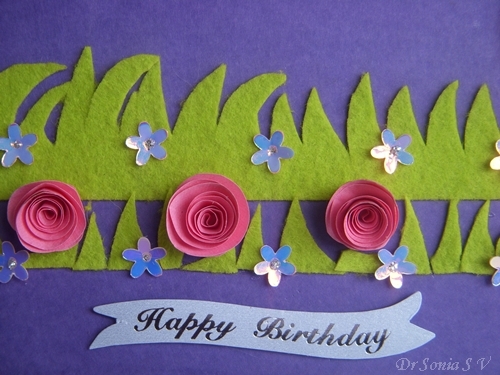 I couldn't allow her imagination to run free for this card as I had to follow a sketch for the ICRC 10 challenge! 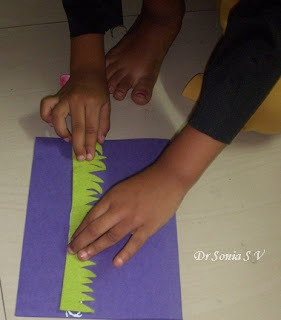 We stuck the scrap bits of green felt as grass blades below the continuous felt strip. 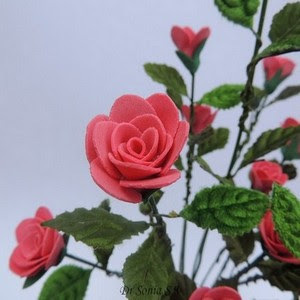 The pink roses are spiral paper roses. 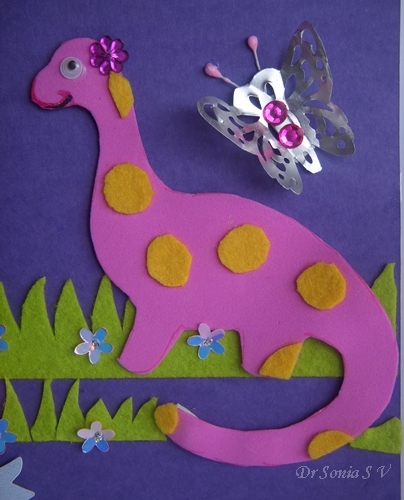 When you craft with a 5 year old little girl-- everything ends up pink and girly so here is our pretty purple- pink girly dinosaur wearing a flower on her head and lipstick on her lips!! 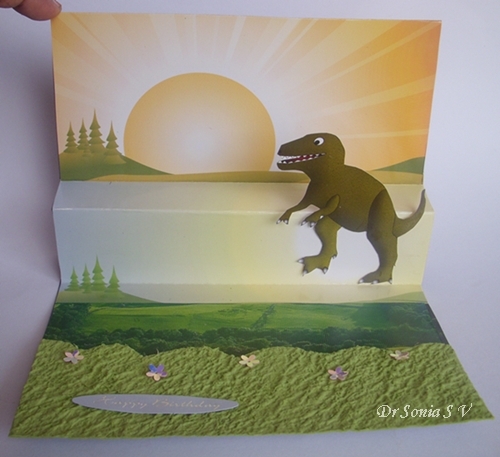 The scenic background of the dinosaur pop up is not a patterned paper or something I printed but one side of an advertisement for a medicine! 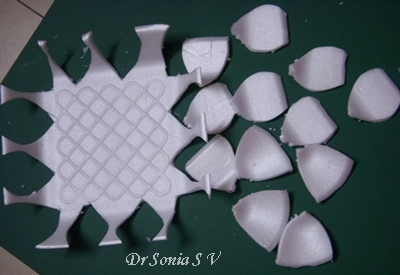 Fold your card valley, mountain and valley as shown here.Experiment before you make your final folds. 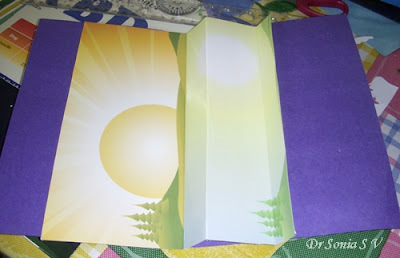 Stick the broad part of the picture on one side of the base card.Then fold it and apply glue on the small part.Fold over the base card so that your pop up will find its own place.Allow enough time for the glue to dry and your pop up scene is ready! 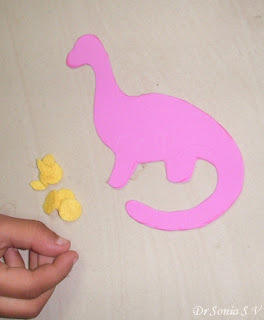 We stuck a Trex [ from sparkle box] on the popping out ledge. 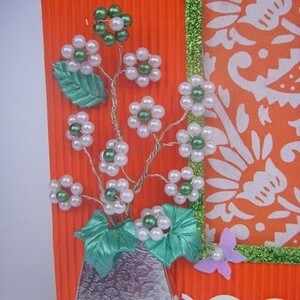 When recycling pictures in card making your picture is often not the ideal size-- our picture covered only part of one side of the base card - so I cut more greenery from a calendar and from some moonstone paper and did a paper collage scene! 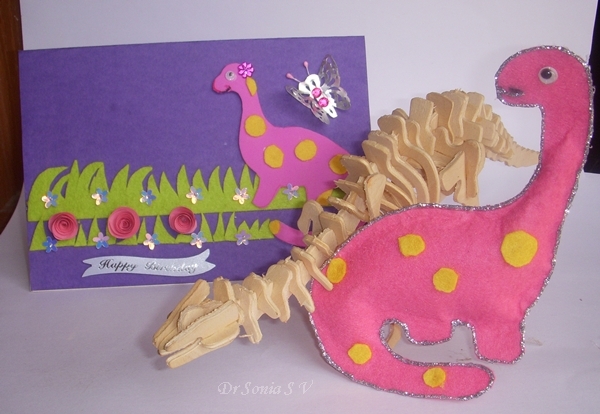 The picture shows our pop up dinosaur card and 2 home made dinosaur toys- shall share more about them in the next post! 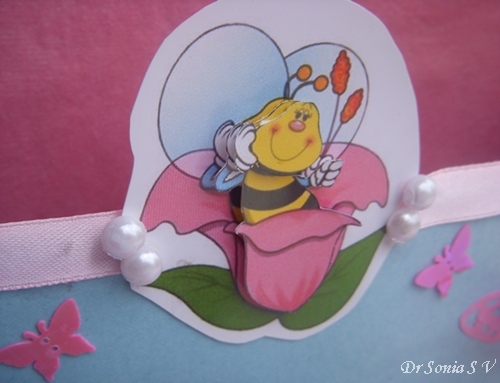 I hope you enjoyed this simple pop up card.Do leave me your comments-- that is what keeps the energy flowing! 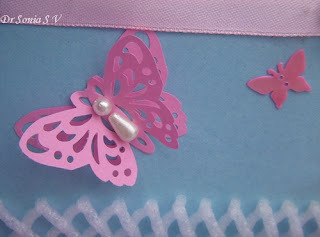 Though I have been blogging for more than a year and am a paper crafter till recently I didnt own many papers or card stock . 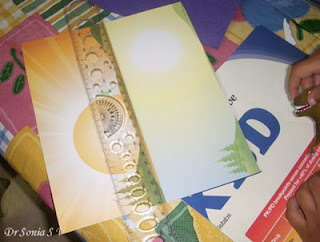 Of late my paper and card stock has slowly started increasing as I discovered places to buy them from! I was also gifted some awesome paper by Asha,Priya,Jaya and Angelin [ all blogger pals!] 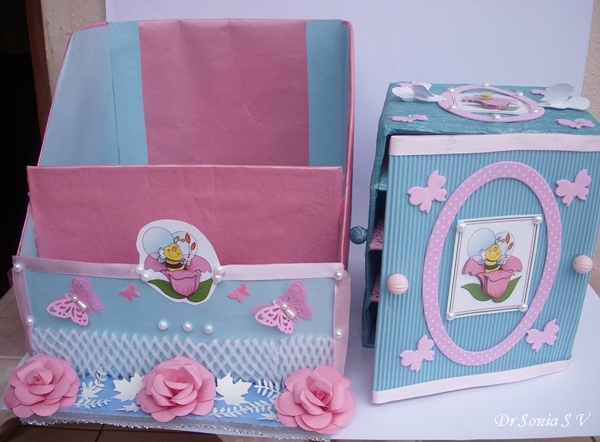 I treasure these more than anything and had to make a lovely storage shelf for them! 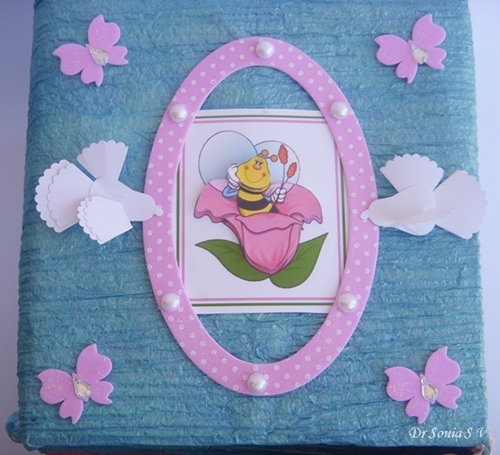 On the door of the paper organizer shelf I added a 3 D decoupage honeybee [ I made 3 of these to use in this project].I made the pink knob for the shelf door from a broken hair accessory! 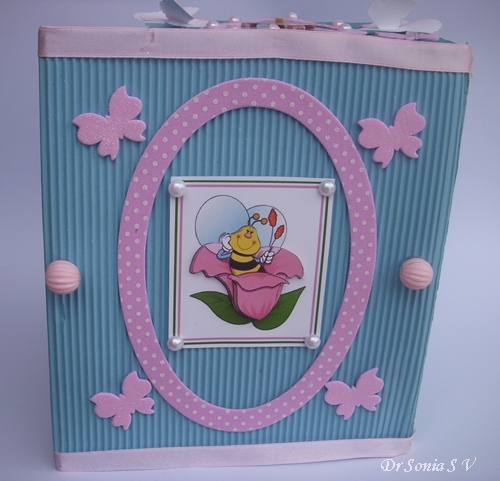 The top of the shelf has the 3 D decoupage bee which I made slightly differently [ difficult to see here !]. Here is the closeup of the 3 D decoupage Honey bee. 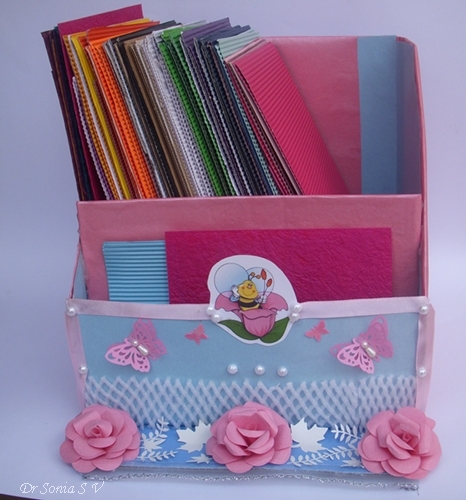 Since my first paper storage idea for the smaller papers was fun to make, I ventured to make a paper organizer for my A4 card stock too. Made it in pink and blue to match my earlier paper shelf. 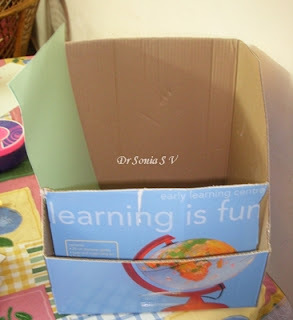 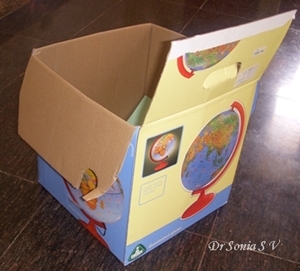 For the A 4 sized paper Organizer, I recycled this old box and made it into a double partitioned Paper organizer. 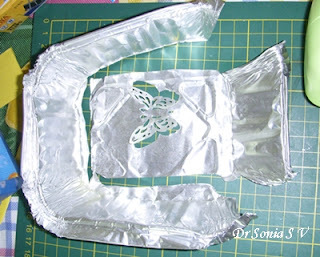 Cut the sides in a slanting fashion. 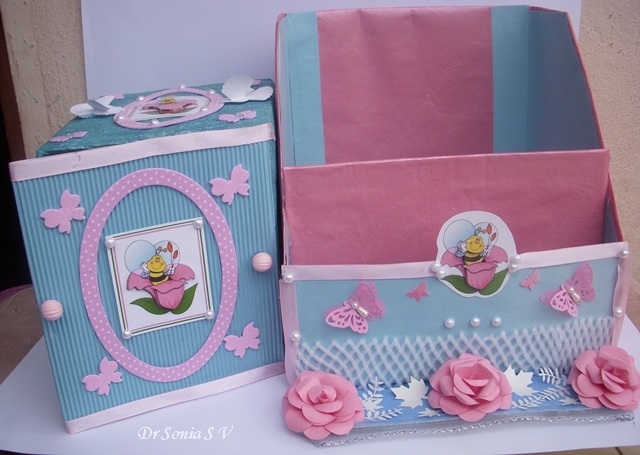 This is inspired from my dear blogger friend Ujjwal who does some lovely recycling too. 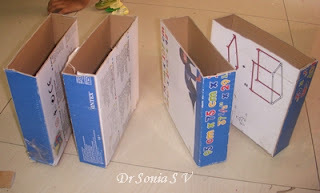 Thank You Ujjwal for this wonderful and useful idea. 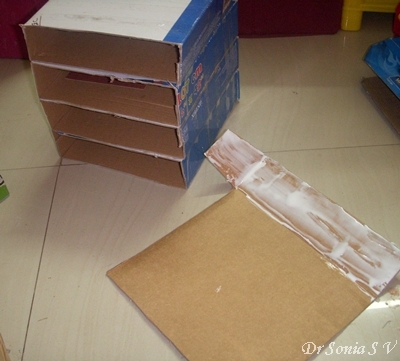 I added a partition to hold paper scraps. The partition was glued on using a glue gun. 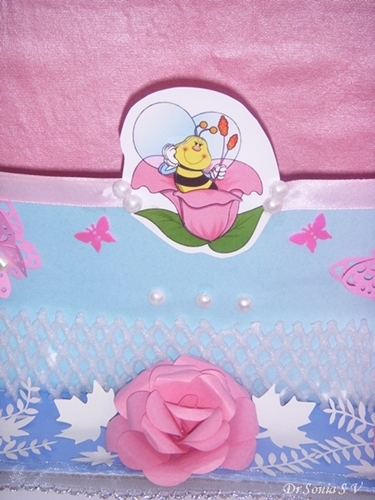 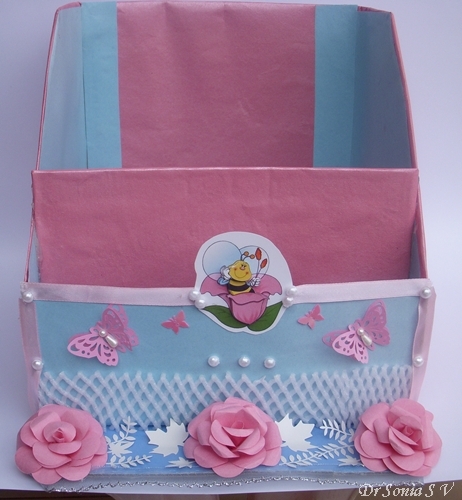 Embellished the A4 paper organizer with 3 D decoupage , butterflies, ribbons and pearls. 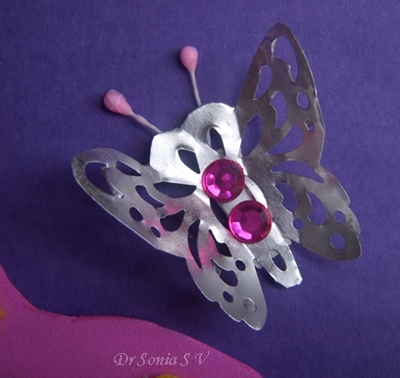 I layered 2 punched butterflies on each other to make this cute butterfly. The pink roses are handmade punch craft roses whose tutorial I have been promising for quite some time! Sorry- coming soon! 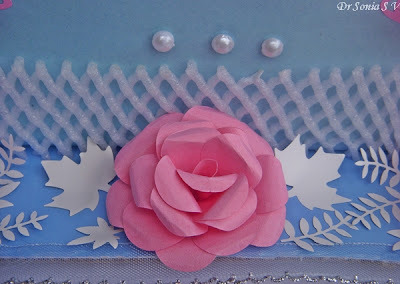 The white fence is -- can you guess?? 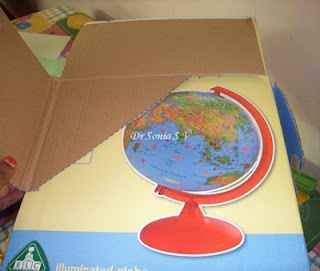 Well its the packaging of apples and pears ! Here is my collection of A 4 size corrugated paper in my new Paper organizer.Daughter helped me to arrange the papers by color! 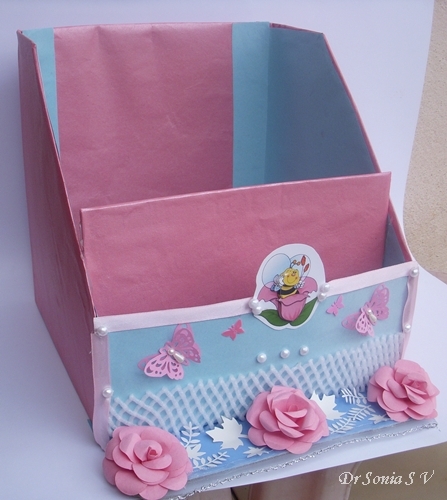 I am quite recycle crazy at times and try to make things from some crazy materials! 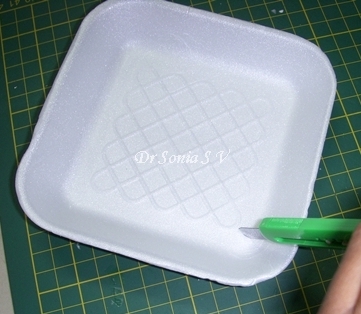 I can never bring myself to throw away the dainty thermocol trays and bowls which are so popular packaging materials in our modern world and when the "junk" heap becomes too big I am forced to think up ways to " make them useful"! 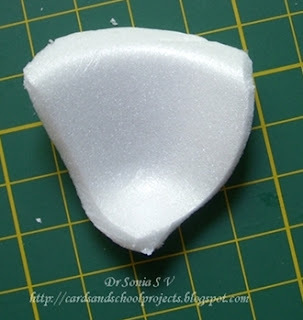 Thermocol is a fantastic medium to craft with.If you like to carve you are going to love this! 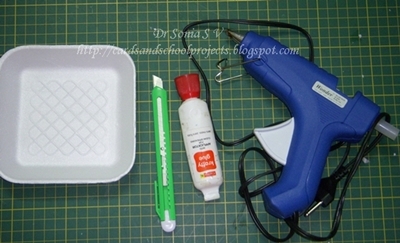 Glue them with your glue gun or adhesive of choice. 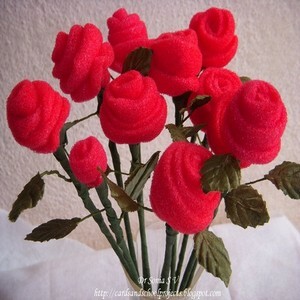 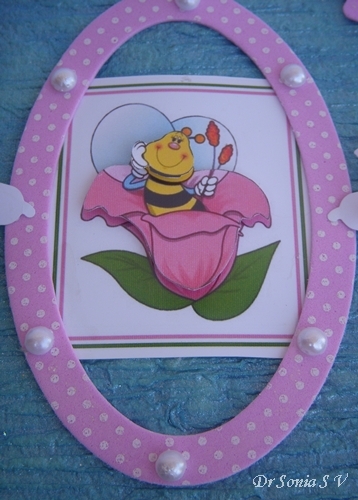 The first time my daughter and I tried this craft I almost gave up as the petals just wouldn't stick with white glue! Imagine my surprise when where I had failed my 5 year old had succeeded! 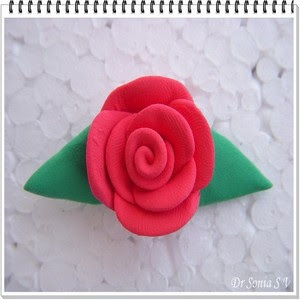 She just made an additional base to stick the petals ! I recently bought a glue gun from the local market [Yes its available in India!] 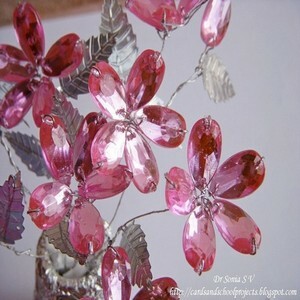 and using the glue gun making these flowers is a breeze! 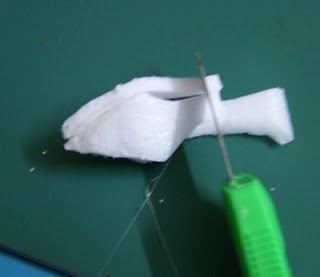 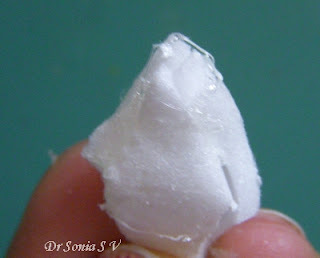 If you are using white glue you need to be really patient . 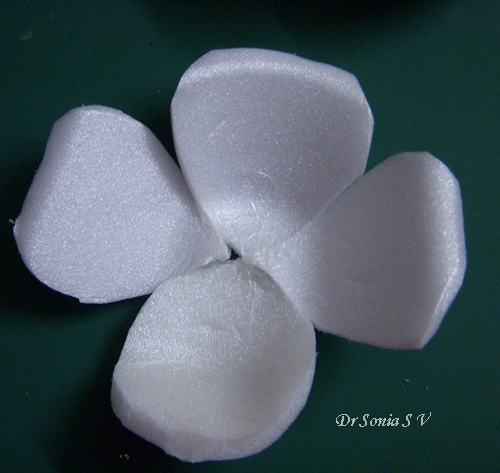 We made a variety of 3 petal, 4 petal and 5 petal simple flowers. Cut petals from the sloping part of the tray or bowl and with the tapering part of the petal positioned on the flat part of the bowl or tray - this will give you a petal that stands up so naturally! 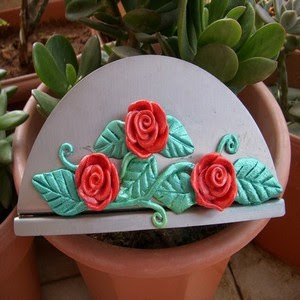 Carve out your large petals from the corners of your thermocol tray. 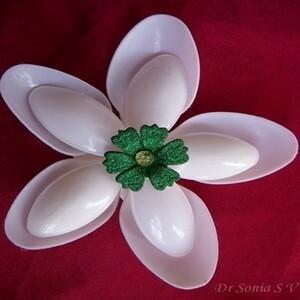 If you are working with a bowl then its even better!The corners give such natural shaped petals. 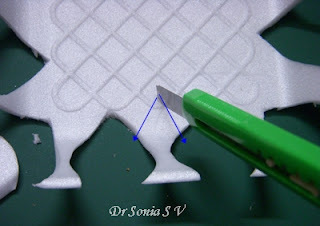 You don't need to mark on the thermocol to help you cut as you don't have to be accurate and it looks more natural if your petals are of different shapes and sizes. 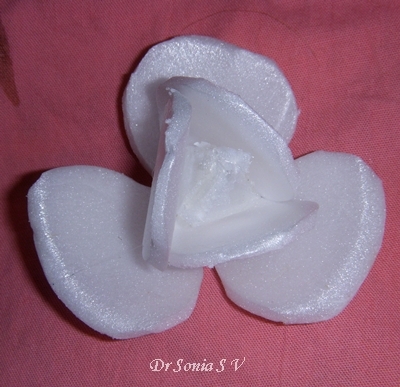 Cut petals of slightly smaller size for the inner layer of the thermocol rose. Make the central bud of your thermocol rose :Cut diamond tipped petals centered on the junction of the sloping and flat part- this will give you a lovely curved shape. 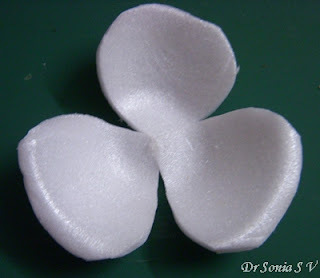 You need 3 or 4 of these petals to make your bud. 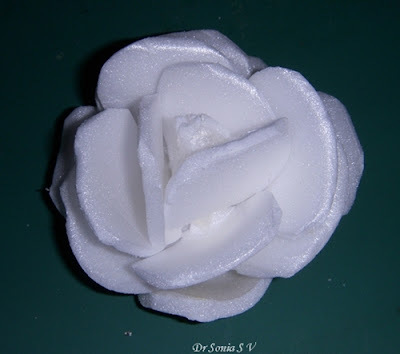 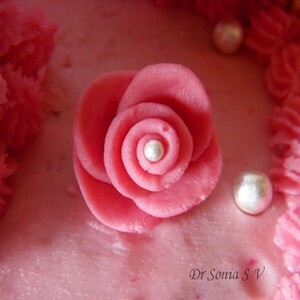 Apply glue to the upper surface of the tip of your inner petals and stick them around your central rose bud. 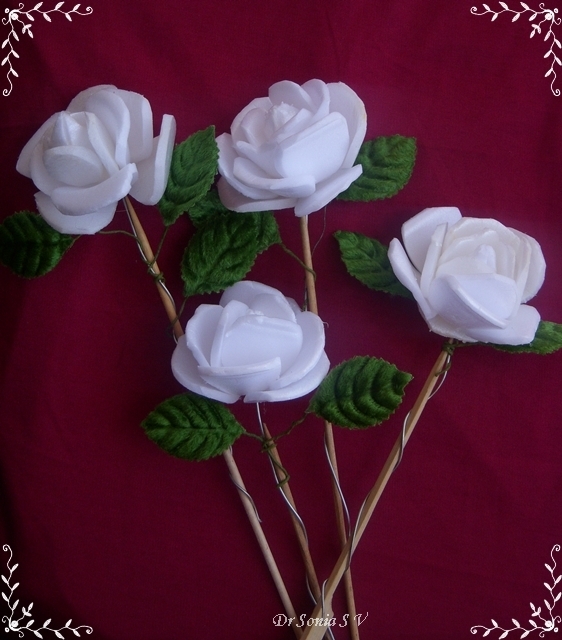 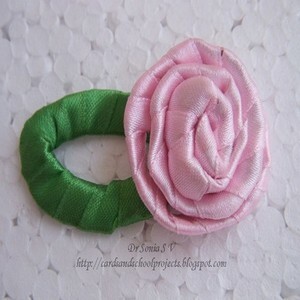 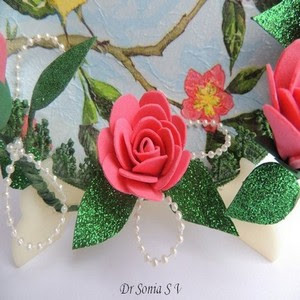 Keep gluing outer petals to get a rose of your desired shape and size. 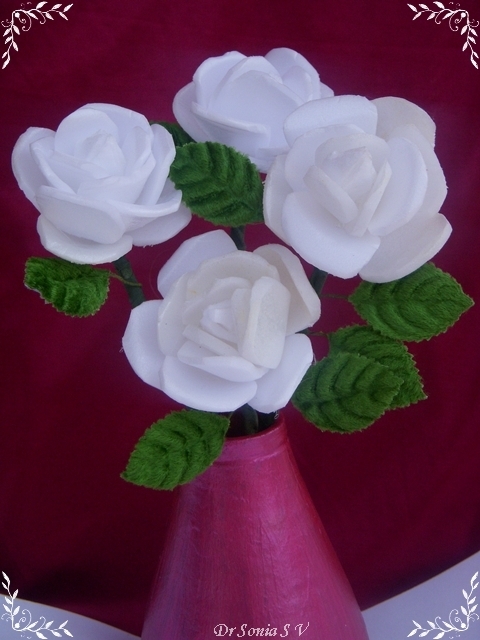 Here is the closeup of another Thermocol Rose- The fun is no two roses look alike! I stuck the wire into the base of the rose and secured it with glue. 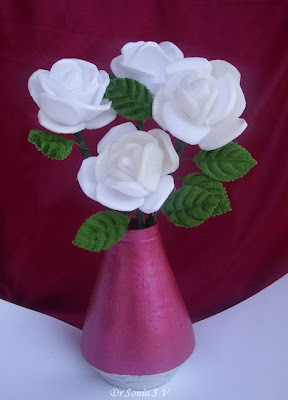 Wrap some green floral tape or ribbon around your stem and you have beautiful rose stems. 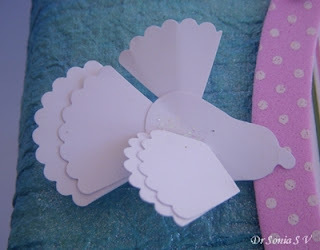 Lots of other ideas for thermocol - make frames, wall hangings, flower vases,swans, butterflies! 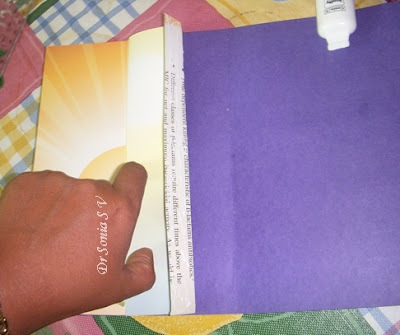 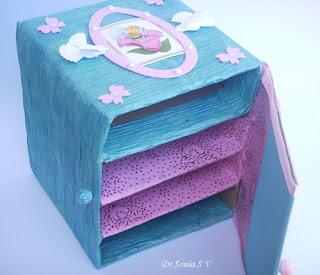 Here is a link to some of the projects in which I have used thermocol: Thermocol Crafts. 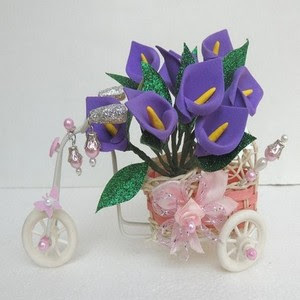 Have fun and do let me know how you like this recycling craft. 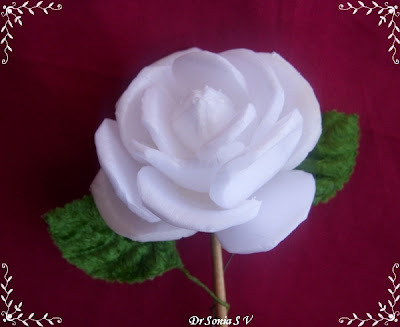 I have made flowers from some crazy materials .Here are links to some "non paper" handmade flower tutorials.